The semiannual SICE Career Fair is our biggest event, but we also host many more career workshops and events throughout the year—including HCI/d Connect for our human-computer interaction design students. Learn more about the Career Fair, including related events and registration. Contacts are key in a job or internship search. Our Career Fair is a way to make lots of them, plus learn about employers, circulate your resume, and sometimes get a next-day interview—all in just a few hours. The fair is open to all SICE undergraduate and graduate students. 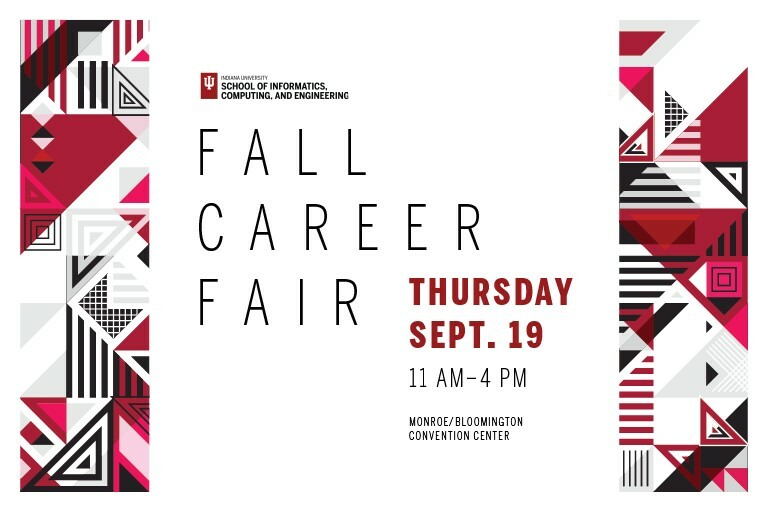 Other IU Bloomington students whose skills and interests make them a good fit for a career in technology may also attend. To make the most of the fair, prepare in advance and use your time wisely. Think of the fair as an interview and treat it just as seriously. You’ll do great! Think about what you want to achieve at the fair and prepare a strategy for how to use your time. Review the list of employers who are attending the fair in SICE Careers. Identify the employers with whom you would like to speak, and figure out what information you want to get from them. Don’t speak with your favorite employers first. Take time to get used to navigating the fair and warm up by talking with other employers. Research the employers who interest you. Visit their websites. Google them. See what positions they have open. Prepare questions to ask the employer representatives. This is your chance to show you’re interested in their organization. Practice answering general interview questions. Hone your elevator pitch about yourself, such as who you are, what you’re studying, a couple of key projects and experiences that have prepared you for your career, what kind of position you’re looking for, and why you want to work for that employer. Print at least 15 resumes. Use high-quality resume paper. It’s a small detail that shows you go the extra mile. Bring either a folder and notebook or a padfolio. It will help you look professional, your resumes will be easily accessible, and you can take notes during your conversations. Dress in professional business attire: a full suit or suit alternative. Wear your most comfortable professional shoes. Inappropriate clothes include jeans, sweatpants, leggings, tennis shoes, flip flops, and other casual attire. If you wear casual attire, you won’t be allowed in. The Career Services office has some professional business attire that is available for students to borrow. To borrow something, contact us. You’ll be nervous, but try to appear confident and relaxed. Employers respond well to a direct approach: make eye contact, offer a firm handshake, and tell them what you are looking for, including two or three possible interest areas. Remember that the representatives are regular people. At one point, they were students at a career fair, too. Don’t be shy about asking for a business card. If you’re interested in interviewing with an employer, ask if they are conducting next-day interviews or will be participating in on-campus interviews later in the semester. Know your schedule for the next day in case the employer asks you to interview. Apply for open positions via SICE Careers or the employer’s website. If employers are holding on-campus interviews during the semester, applying through SICE Careers is the first step in the interview process. Make sure to apply by the resume submission deadline, which could be the day of the fair. The next day, send a thank-you email, card, or LinkedIn message to the representatives you spoke with. Within one week of the fair, contact the representatives you spoke with again. Employers may leave the fair with hundreds of resumes, and fewer than 5 percent of students follow up after the fair. This simple step can give you a significant advantage.